100 Accurately reproduced die cast figures, measuring approximately 7 cm (2 3/4"). 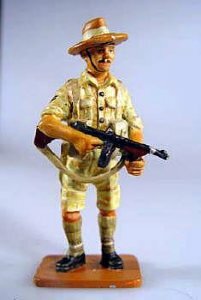 This collection brings you unique hand-painted figures of soldiers from the most characteristic regiments of the wars of the 20th century. The original Osprey Booklet is no longer in production. Size: Scale is 1:30 / 60mm.